I learned that Galen Dara has been shortlisted for the Chelsey Award with her illustration to my story “A City on its Tentacles” in Lackington’s Magazine. I am so incredibly happy for Galen. It was truly an honor to have my work illustrated by her, and the octopus painting is just so true to the spirit of my story, and it’s such a beautiful and heartfelt painting – I love it so much and I am thrilled to see it honored. Another person who absolutely deserves a sea of kudos is Ranylt Richildis, the editor of Lackington’s Magazine. 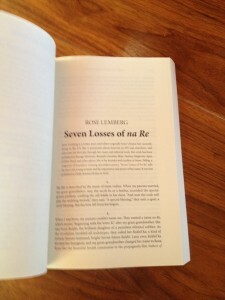 Yes, I am a contributor, so I am a bit biased. That said, Ranylt has consistently produced a beautifully curated and presented magazine that showcases an inspiring variety of writers and artists; it’s always such a joy to read the magazine. And now you have seen Rose gush, a less than frequent occurrence! I sold a short mythic poem titled “A Riddler at Market” to Uncanny Magazine. It’s short, homey, and has many food items. 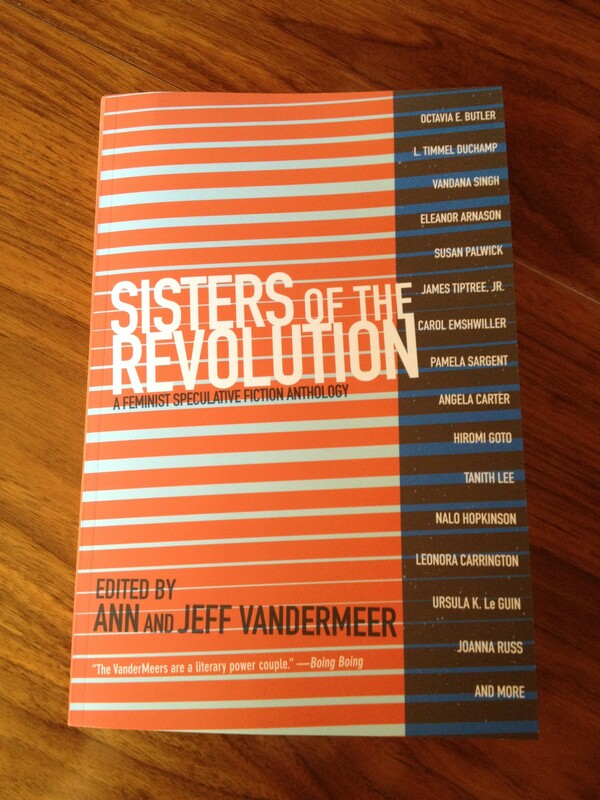 It’s dedicated to Delia Sherman and Ellen Kushner, and it’s a part of AoE backer rewards. My Birdverse novelette “Grandmother-nai-Leylit’s Cloth of Winds” is out at Beneath Ceaseless Skies. This story has queer families (a cultural default for Khana women), and striving for acceptance within the family; it has generations of women and trans people, and friendships, and autism, and very many bonus carpets. It takes place in the south, and while there are white people in Birdverse, there are none in this story. I love this story. I cannot explain to you how much it means to me, and how happy I am to share it with you. I am happy to answer any questions about this story, by the way – please leave a comment here or tweet at me! A note on stress: Khana names ending in -ah, -eh, -it, -et, -at and -el have ultimate stress, so TammAH, GitIT; names ending in -i tend to have word-initial stress, so KImi, BAshri. Kimi does have what we would diagnose as classical autism. The Khana do not have exact word correspondences for our contemporary diagnoses, but developmental disabilities and language delays (and, of course, physical disabilities) are known. A male child whose educational progress is delayed may or may not be able to pass the tests to gain admission to the inner quarter. These tests involve linguistic as well as mathematical aptitude, as the Khana men are supposed to engage in scholarship of the Writ, and in Holy Artifice. In practice, the vast majority of male children are admitted even if their performance on the tests is weaker, and not all inner-quarter residents go on to become scholars and artificers. A significant speech delay, however, is a major issue. Many autistic people feel the need to roam, wander, spin, and engage in other types of movement which are calming and emotionally rewarding. In the modern American culture children’s roaming is restricted regardless of disability level, but other cultures are not like this, including many contemporary earth cultures. Kimi’s roaming in the desert is not restricted, and this is normal rather than neglectful for the culture. Surun’ family structure is different from Khana family structure in that there is no major gender segregation, and marriages between men and women are the norm. The woman is expected to add her husband’s names to hers, while men as a rule do not take their wives’ names. Thus, Naïr e Bulvát’s husband’s name is simply Bulvát. However, they do recognize more than two genders, and allow for non-heterosexual and non-monogamous unions; Benesret e Nand e Divyát had two husbands. The Queers Destroy Science Fiction! Special issue of Lightspeed Magazine is out and available for purchase with new stories, flash, non-fiction articles, and interviews. My full-length short story, “How to Remember to Forget to Remember the Old War,” is available as an exclusive ebook/print content. I also have an author spotlight in this issue! (Some info about the story). I share the table of contents with Bogi Takács (always love when it happens), who has a flash story “Increasing Police Visibility” (it’s a hard SF flash about statistics and border control). Bogi also has a new story in June’s Clarkesworld – “Forestspirit, Forestspirit,” which I beta-read and which is a poetic hard SF set in Hungary (bonus notes here). It’s eir first sale to Clarkesworld! Next week, I hope you watch out for a new issue of Beneath Ceaseless Skies, with my Birdverse novelette “Grandmother-nai-Leylit’s Cloth of Winds”. It’s the first one of my three upcoming Birdverse novelettes, and I can’t wait to share it with you! Julie Dillon’s art for the upcoming issue is fabulous and works great with the feel of my story. Today’s mail included a hefty package from PM Press. 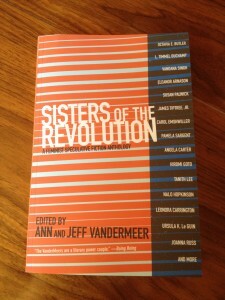 Inside was my contributor’s copy of Sisters of the Revolution, edited by Ann and Jeff Vandermeer. And here, between James Tiptree, Jr.’s “The Screwfly Solution” and “The Evening, the Morning, and the Night” by Octavia E. Butler, is my little story. This happened. This really, really happened. A few weeks later, I wrote a story about alt!Warda, who is younger than Warda in “Pockets”, and who is a sociolinguist instead of a musicologist. I asked Amal if that was ok; she was delighted. My story is called “The Shapes of Us, Translucent to Your Eye.” It’s magic realism about a woman academic’s life, complete with budget cuts and ghosts. There’s nothing unlikely about it; but it will indeed appear in the Journal of Unlikely Academia. Here is the full ToC! I cannot wait to share this story with you! I wrote “These are the Roads…” with Bahamut in mind. It’s yet another piece about immigration. I hope you give it a read and tell me what you think. 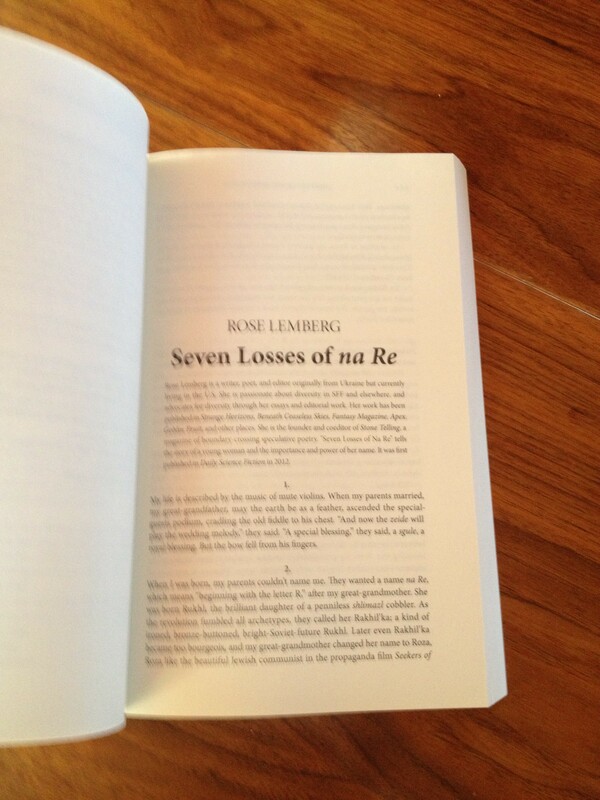 M Sereno highlighted my poem “Long Shadow” in her heartfelt entry Out of Fracture. I am very grateful to see my poem included among so many of my favorite pieces. I promised to let you know when the podcast of “Long Shadow” goes live. Here it is at Strange Horizons, together with poems by John W. Sexton, Liz Bourke, and Elizabeth R. McClellan. I am very proud of this poem and separately, of this recording. I read “Long Shadow” in 5 voices (Journeymaker, Marsh Oracle, Biruté, Long Shadow, and Keddar); and though it is very much not perfect, I’ve put a lot into it and I would be thrilled to hear what you think about it. Since it is so long, I am also making the file available on my website separately, rather than as a part of a podcast: http://roselemberg.net/wp-content/uploads/2015/04/longshadowcompressed.mp3 (click for text).